Most studies of hydrologic responses to climate variability do not account for changes in vegetation that may co-occur with changing climate. Warming has lengthened the growing season. Longer growing seasons result in greater forest water use, and hence less streamflow. 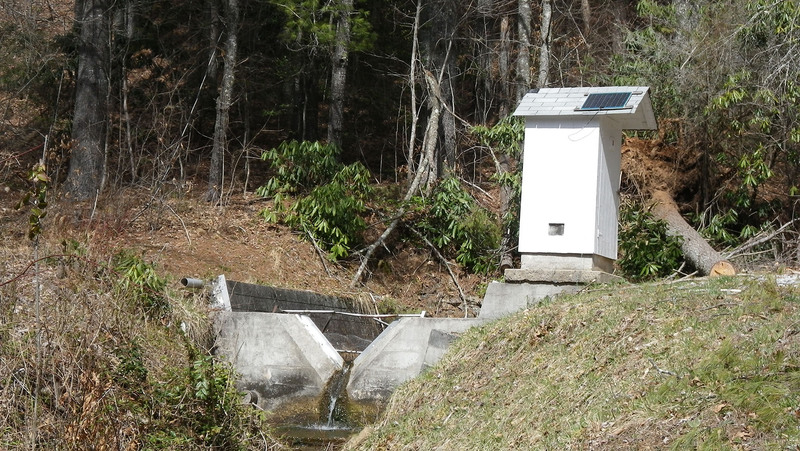 Accounting for this variation in a process-based model improved predictions of streamflow and will help watershed managers anticipate and plan for changes in future water supply. Forested watersheds provide important ecosystem services such as high quality freshwater, flood mitigation, and maintenance of base flows. Climate variability could dramatically alter such ecosystem services; however, most modeling studies do not account for co-occurring changes in forest vegetation structure and dynamics that influence water use and impact streamflow. SRS researchers used a combination of remote sensing, gauged watersheds, climate measurements, and modeling to understand changes in climate, vegetation, and streamflow. Long-term climate and streamflow data indicate that forest vegetation has begun using significantly more water over the last three decades. Increased water use was significantly correlated with changes in growing season length and vegetation growth. The longer growing seasons and faster growth are primarily attributed to increases in minimum temperatures – the coldest days of the year are not as cold as they once were. Minimum temperatures are increasing faster and more consistently than changes in maximum temperatures. Incorporating changes in temperature-driven phenology and vegetation growth responses into a process-based model improved streamflow predictions.